First of all let me say this, even though the title may suggest it, this story is not about me. The guys looked down on me as I stretched that tape with both hands across the seat. It was not easy, but finally I said “It’s just shy of 46”. Wow, 46.” said Gary. “46 Wahooooo” a collective shout went out. Did you get any photos? Yup. Lets take a look, I want to see that fish!!! I had to get my glasses, so Gary took my digital Nike and the little screen soon revealed the first photo of the great fish. We all crowded around as Gary flipped through the 4 photos of the fish. It was a tiny screen, but that fish looked HUGE. 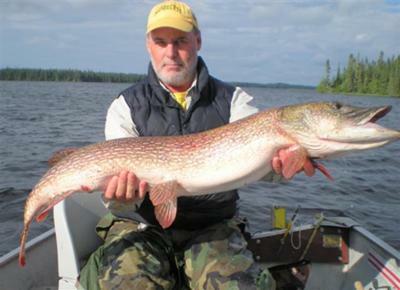 “What a monster pike!” Doug said That’s UN-believable!! Everyone was shouting, and pumping me on the back, like I had just scored the winning touchdown. I started getting teary eyed and emotional. Not used to all this attention. Oh well. Greg was yelling your going to be Famous Mike, and Mike C chimed in “Famous Mike!! From now on you’ll be Famous Mike. You’ll be famous!!! That’s your name from now on, as some of the guys were dancing around doing jigs. Famous Mike!! !” and well, that’s how I became Famous Mike. Since we had two Mikes in our group they were trying to tell us apart anyways. So that was it. Now, for the juicy part. How I caught the 46” pike that I ended up calling “Goldie”….. Ooopppps. I cast with the wind most of the time, and bam was hit hard mid way through the retrieve. I struck back setting the hook hard twice in rapid succession, without slacking the line. It felt heavy, but I’ve been fooled before, and was reeling in hard when the fish decided to assert itself, and took off hard to the right. My reel was singing weeeeewweeeeerrr, as it took out line. My drag was set perfect for a change!!! The sound of line slowed some and then took off anew weeeweeerrrrrr it went out fast again. I yelled to Glen that “It’s a real big one” so I took a chance and set the hook again twice when it started to slow. Those quick jabs started to turn that fish like a big semi-trailer making a u-turn on the interstate. My strong rod was bent double with strain, but the fish was coming, and then we saw it!!!! What a monster!!! Dark forest green, big bodied and long. “Oh my God, its HUGE! !” Glen said. This was not a long, thin hammerhead. This is a champion weight lifter!! An elite athlete!!! This is the king of Wright Lake, and maybe all of Ontario!! Glen had our big net ready, but I said “no wait” as it veered abroad side us and then dove deep while turning, and going below the boat, right under me!! I jammed my rod tip straight down into the water on the side of the boat up to the handle, and hoped the prop or the boat would not slice the line. I felt some twanging and worked the rod tip up from under the prop. The twanging turned into sharp poping jerks and I knew the fish was in the heavy weeds. The wind was working against us now pushing the boat sideways across the bay. I had to get the fish out of those weeds fast, or they would break my line, but my rod was bent double already!!! Working him out slow and steady, I was thinking any jerking and he will dig himself into those weeds, and I’ll never get him out. The line was still twanging and popping, but he was coming up slow and heavy. Suddenly, there he is!!! Coming up from the weeds!!!! He turns and that big rear fin shoots water all over us, almost like he’s disrespecting us. Were spitting and blinking water out of our eyes, and he makes another big run. Weeeeweeerrrrr goes my reel again, but this time not so deep. I turn him, and he’s coming straight in, but he turns just out of our reach and makes another run to the right. Weeeweer. But not so long this time. Are you getting tired? Suddenly he’s coming right toward us!! Perfect!! Glen is standing poised with the net. “Head first and from below”. I remind him, not wanting to chance loosing him at the last second. Glen performs the maneuver perfectly, and suddenly he’s in the net, and Glen is lifting this fish I will later nickname “Goldie” out of the water. Then he stops, and the net and fish fall back into the water with a splash!!! Aiiiiyeeee!! Goldie is too heavy for Glen to lift, and I can just see that fish thrashing out of the net, or breaking through the bottom!!! I quickly throw my rod aside jump over the middle seat, and grab the frame of the net on the side. With four strong hands, and both of us straining Goldie comes into our boat. Whhhaooooha!! Quickly I grab the bottom of the net and flip Goldie into the bottom as gently as I can. He starts to thrash, and I pin him against the seat with my boot, and cover his head with a wet towel. The stinger lure is snagged in the net, and the fish. My jaw spreader, and pliers are in my hands in seconds, and I worry the hook out without damage. Glen removes the net and I hand him my camera. Luckily we had done this hundreds of times in that last week. We’re always quick, but never with a fish this big!! Suddenly I wish my big hands were bigger, as I cradle Goldie. There is no way to hold him!!! He trashes and I almost lose him over the side. Wooooowwww. Quickly I try again, and it works if only he will stays still!! Click, photo #1, He thrashes and my hand goes up into his spiny mouth!!! Yeooooowwww. I yell, Click, photo #2 One last time, he seems to go rigid and tense like a board. Goldie is bloody now with my blood as I hug him to me!!! Click, photo #3, and #4. He starts to thrash again so I unceremoniously chuck him over the side. Usually we CPR a fish, but he was so big. Glen and I do the slimy hand shake/high five, and we both let out a big whhhoooppp to break the Canadian silence. He questions my release technique. “I couldn’t hold him, when he started to thrash around. I would have had to let him drop in the bottom of the boat. My back would have given out if I tried to cradle him over the side, and he was still so green. I just threw him over, and knew he would be all right. My only regret is I would have loved to admire him a little more, and see him swim away. But, he’s best back in the water.” We both agreed he had been out of the water for about a minute. “Pretty good, and pretty good for the fish.” Glen said. “Wow what a monster, and what a battle”!! That was the story of how I became “Famous Mike”. The end.